Each Sampler Pack contains: Instant Kava mix Cocoa (2oz) | Kava Powdered Root plus (4oz) | 30% Kavalactone Capsules (6 caps) | Kava Single (1 pack) | Muslin Infuser | 10% Coupon on your next order here or at Kona Kava Farm. 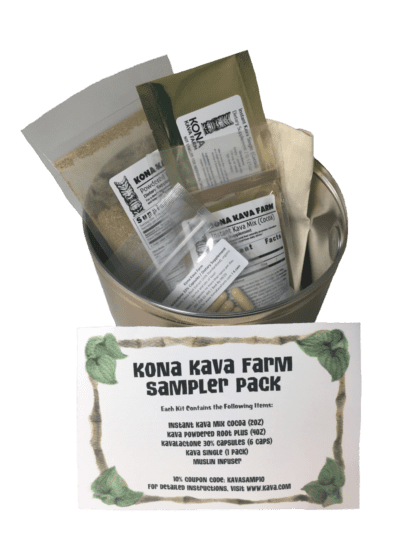 This Kona Kava Sampler Pack gives you an idea of the many lovely Kava Kava products that Kona Kava Farm has to offer. Each Sampler Pack contains: Instant Kava mix Cocoa (2oz) | Kava Powdered Root plus (4oz) | 30% Kavalactone Capsules (6 caps) | Kava Single (1 pack) | Muslin Infuser | 10% Coupon on your next order here or at Kona Kava Farm. These Kava Sampler Packs is such a Top Selling item here at KavaDotCom that we’ve been tempted to come out with our own Kava Sampler Pack! But, until then, enjoy the Kona Kava Farm product, and come back to us for all your kava-related needs. Yes, the coupon is for Kona Kava Farm, but we do honor it here as well, and it gets you 10% off your order, no matter what brand you choose. There’s a 5-minute Crash Course in Kava to help you use your new Kava Sampler Pack! Check out the additional images to see exactly what the pack looks like. 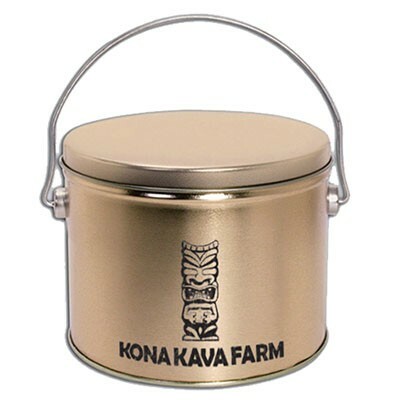 It comes in a collectable tin with the Kona Kava Farm Tiki God. At the moment, the tins are gold with black logos. Soon, there will be a choice of matte black tins with gold logos. Check back for that; they will also be sold separately as well. Nothing pleases us more than to hear such positive response to our Kava! A sincere thank you from the entire team at KavaDotCom! That’s a great idea, Jessica; we’ll work to add a sampler pack of capsules!